Conversations with and suggestions by Elena Anagnostopoulou, Karlos Arregi, Jonathan Bobaljik, Eulàlia Bonet, Seth Cable, Oana Ciucivara, Carmen Dobrovie-Sorin, Daniel Harbour, Heidi Harley, Jim Harris, Susana Huidobro, Conor Quinn, Norvin Richards, and Jochen Trommer have greatly assisted the shape and scope of this paper. 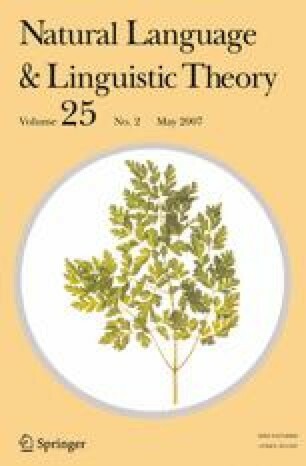 Many thanks are also due to Marcel den Dikken, two anonymous NLLT reviewers, and Welton Blount for their careful reading, many remarks leading to improvements in clarity and solidity of argumentation, and editorial keenness. An early version of this paper appeared in Harvard Working Papers in Linguistics Volume 11. An erratum to this article is available at http://dx.doi.org/10.1007/s11049-016-9345-9.